In a small bowl, beat the eggs with a fork or wire whisk until yolks and whites are well mixed. In an 8-inch skillet, heat the butter over medium-high heat until hot and sizzling. As butter melts, tilt skillet to coat bottom with butter. Quickly pour the eggs into the skillet. While sliding the skillet back and forth rapidly over the heat, quickly stir the eggs with a fork to spread them continuously over the bottom of the skillet as they thicken. When they are thickened, let stand over the heat a few seconds to lightly brown the bottom. Do not overcook--the omelet will continue to cook after being folded. Tilt the skillet and run a spatula or fork under the edge of the omelet, then jerk the skillet sharply to loosen omelet from bottom of skillet. Add favorite filling, if desired. 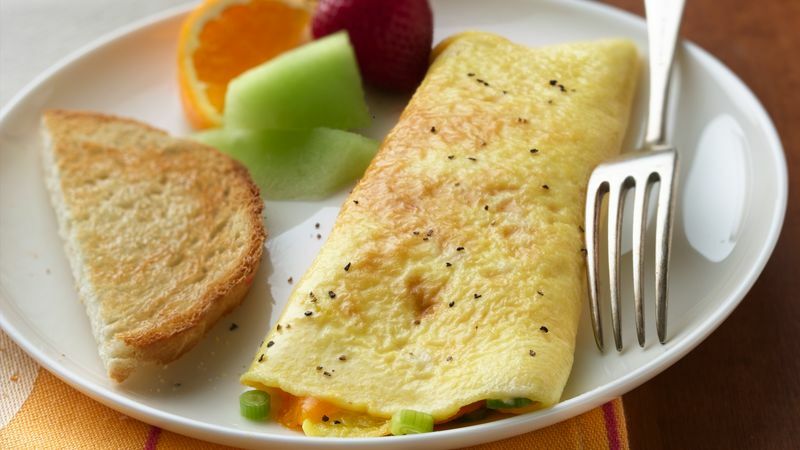 Fold the portion of the omelet nearest you just to the center. Allow for a portion of the omelet to slide up the side of the skillet. Turn the omelet onto a warm plate, flipping folded portion of omelet over so the far side is on the bottom. Sprinkle with salt and pepper. Before folding omelet, sprinkle with 1/4 cup shredded Cheddar, Monterey Jack or Swiss cheese or 1/4 cup crumbled blue cheese. Cook 2 tablespoons chopped cooked ham, 1 tablespoon finely chopped bell pepper and 1 tablespoon finely chopped onion in the butter about 2 minutes, stirring frequently, before adding eggs. To warm a plate for serving the omelet, run hot water over the serving plate and dry it thoroughly, just before cooking the omelet. Omelets cook quickly, so always have your filling ingredients ready before you begin cooking the eggs. The butter should be sizzling before the egg mixture is added. After loosening the omelet from the skillet, fold portion of omelet nearest you just to center. Tilt skillet, letting flat unfolded side of omelet slide out onto plate. Flip folded edge of omelet over the flat portion on the plate.